47 acres with 1,400 feet of shoreline along the east side of Hood Canal, north of the Tahuya State Forest in Mason County. This property is Capitol Land Trust’s northernmost property, and our only property on Hood Canal. 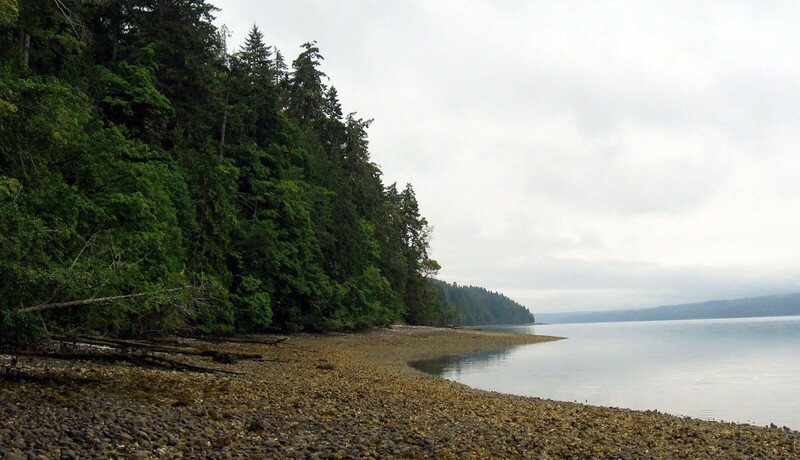 This property protects nearshore habitat, providing crucial protection for existing wild salmonid populations, as well as important forested and freshwater riparian habitat along two perennial streams and two springs which feed into Hood Canal. The property has stands of old-growth Douglas-fir, Western redcedar and Western hemlock, some trees reaching six feet in diameter. The property provides wildlife habitat for mammal and bird species including habitat for black bear, red fox, northern flying squirrel, bald eagle, great blue heron, osprey, marbled murrelet and pileated woodpecker. Years ago, my wife Clare and I fell in love with the dynamic landscape of Hood Canal and the Olympic Peninsula with their contrasting mountains, forests, inland seas and the diverse flora and fauna. Clare, a biologist, and I, a geologist, began studying the area in 1968. In 1973 we decided to purchase a small piece of land that, ideally, had these attributes: wilderness, large acreage, splendid view, a potable stream, and waterfront. Bit by bit over the years we added to the original tract to acquire nearly 20 hectares of forest, with almost half a kilometer of beach, on the east shore of Hood Canal. The view is over this westernmost arm of Puget Sound to the Olympic peaks including Mounts Ellinor, Washington, and Pershing. We call the property Brothers Beach because the view also includes the three peaks of The Brothers, and because we have three sons Ben, Chris, and Henry who have shared in our love of the place. Decades ago, our parents visited and helped us build our dream of having a forest retreat; now it is rewarding to see our grandchildren enjoy the cabin, the woods, and the water. We hold vivid memories of quiet evenings spent in the cabin listening to the waves on the shore, the creek below the spring, and sometimes an owl in the surrounding trees. The forest, which had some logging in the late 1800s (from the water) and early 1970s (for road building), contains giant Douglas firs (many over 60 m tall), western red cedars, western hemlocks, and bigleaf maples, as well as more than a dozen other species. Over the years, we have recorded 115 bird species and 20 mammal species near Brothers Beach. In 1980 we felled five trees, and using a portable sawmill, cut most of the lumber for a small cabin. A wood stove is used for cooking, heat, and hot water. Near the cabin we have planted dozens of trees, shrubs, and flowers native to western Washington but not originally on the property. About 3 km of trails in the uplands and along Hornet and Heusser Creeks are maintained. We built the cabin and the trails ourselves as if we were early homesteaders (our sons are fifth generation Washingtonians). We often feel as if we have entered a time warp when we plan our meals around the tide. Daily we walk the access road, the trails, and the beach, picking up litter along 5 km of shoreline. Hood Canal, and particularly its east shore, is a peaceful retreat worthy of protection from the rapidly developing areas of the Puget Lowland. Brothers Beach has become sacred to us. Four generations of our family and close friends have appreciated its beauty for the past four decades in all seasons of the year and in sun, rain, wind, and snow. The sound of the rain on the metal roof at night, and the image of moonlit snowy peaks beneath sparkling starry skies are but a few of the lasting memories of Brothers Beach. We have seen killer whales in Hood Canal, river otters sliding down our snow-covered trail to the gravel beach, and bears scavenging for food in the forest. We have observed the snow accumulate then melt on the Olympic peaks, the hummingbirds arrive in March and then disappear in August, the first flowers on the maples in spring and the fall of their huge yellow leaves in autumn, the sound of loons and gulls, and the arrival of rafts of grebes, buffleheads, and goldeneyes during migration. We have felt the cold water hit us as we dropped from a rope swing into the water, and paddled into the wind, waves, and current. We have sat in awe of a thousand sunsets. My favorite definition of an old growth forest is one with multiples species of many large trees (much larger than the two-foot diameter now used in many national forests, because so little old growth remains), abundant snags for habitat, and considerable large woody debris on the forest floor and in the streams. By this definition, Brothers Beach is an old growth forest, rare in the Puget Lowland. Such forests need protection for the species there, and for the habitat they provide for other species. I am thrilled every time I see the rectangular hole of the pileated woodpecker, or hear its drum roll or shrieking call, or watch the flash of red as it glides through the trees. Equal is the excitement of sitting on a log on the beach at high tide, watching a merganser mother with a dozen chicks swimming along the edge of the water. It is impossible to put a monetary value on such experiences. If you cannot imagine subdividing, selling, developing, or logging your property, why not protect it forever? If its value as wilderness, habitat, and/or scenery is much greater than its value on the real estate market, why not conserve it? If you would like to pass onto future generations of your family not only your property, but the same stewardship ideals and environmental philosophy, why not set up a conservation easement? The tax benefit is significant, but more important is the peace of mind knowing that this Pacific Northwest forest and this shore of Hood Canal will always exist more or less as they are. Brothers Beach will always be more of a natural landscape than a human-impacted property. The frogs will fill the summer evenings with their serenade, and the garter snakes will lie in the sun awaiting the rough-skinned newts slowly creeping through the decaying leaves. Our hope is that changes within the Brother Beach ecosystem will be natural, and that by conserving it we will help to offset the impact of our species.